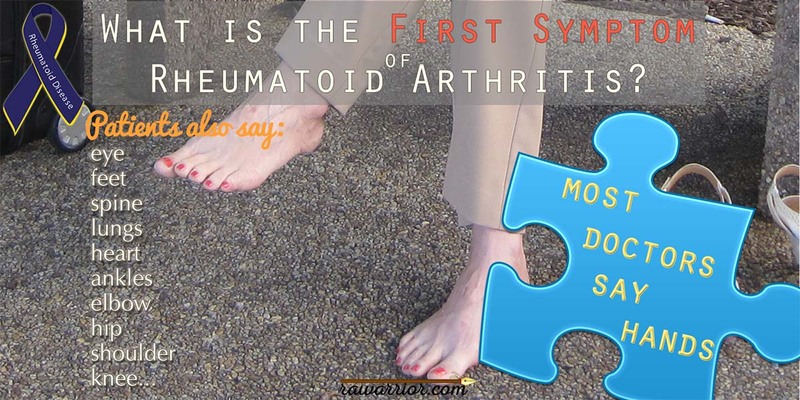 What Is the First Symptom of Rheumatoid Arthritis? Do people with Rheumatoid Disease (PRD) have the symptoms they’re expected to? From what I’ve read in books and online, the first symptom of Rheumatoid Arthritis is supposed to be in the hands. So that it can be diagnosed. Because most diagnosis RA by the hands. (A bit of a circular argument, but that’s how it is). I’ve mentioned to you before that hands are considered central to diagnosis of Rheumatoid Arthritis. Is There a Typical Rheumatoid Arthritis? Many researchers and doctors consider RA to be primarily a disease of the hands and wrists. Other small joints can be affected, they say, but hands are first. According to PRD, many doctors examine hands to diagnose as well as to judge disease activity. Is that an accurate description of the first symptom of rheumatoid arthritis? How do I know? I know because I’ve gained a broader perspective by reading many thorough articles on diagnosing RA like this one. Also, I’ve spent even more time reading the accounts of actual people with Rheumatoid Arthritis. Many PRD do not experience symptoms in the hands early in the progression of their disease. In some cases, those PRD are not following the pattern which is set forth by those who officially authorize and certify a “definition” of Rheumatoid Arthritis. This is can make diagnosis difficult. I am one of those lucky peeps whose Rheumatoid Arthritis struck my feet before my hands. The pain began at age 15. The occasional pain or swelling got worse over the years. Early in 2006, there was intense swelling and pain which caused deformity literally overnight. One morning, I awoke with a toe that had moved about 45 degrees. I could not walk on it. Within 24 hours, the other foot did the same thing. At least they matched. Within a few days, RA attacked several joints on both feet so that I could not wear shoes. It felt as if I were standing on rocks all of the time. It took a few doctors to realize that this was actually RA. In fact, I was not diagnosed until it had spread to several other joints. Incidentally, that did not include the hands at that point. Since I did not realize the seriousness of my fate, I never took pictures of those unbelievably deformed feet. Fortunately for me, the swelling went down and I can walk short distances now with only moderate pain. However, I have a completely different pair of feet. RA feet. Updating this now in 2016, I’ve had many injections over the years in my feet to bring down the extreme inflammation. I still see the same podiatrist who splinted my feet 10 years ago to help the joints come back in line. He helped diagnose my RA. The lumps beneath the base of the toes are always there, but ice packs help somewhat. Please add your comment below to tell us about your first symptom of rheumatoid arthritis. Or you can answer for someone you know who has RA. Please read through the hundreds of comments by patients to see the wide variety of first symptoms. For me the pain started in my hands and elbows. My first nodule was on my left elbow. I’ve heard of nodules on elbow but where? I have RA & nothing I can feel on elbow however my fingers are starting to deform and my toes (big toes) can feel nodules on side of big toes. Sometimes so painful especially my fingers. Nodules can be just about anywhere. Elbow seems to be a typical starting place, especially on the back of the elbow. Also, they are common on knuckles. They can begin tiny like a pea or become much larger. I have the nodules on the bottom of my feet in the ball of my left foot size of grapes. My big toe is deformed and will not bend. I had one removed out of my wrist 17 years ago that is when I was sent rheumatoligist. Pam,you are the first person I have heard comment on soles of feet,along with my eyes they were my first symptons. I had pain in one foot and could hardly walk on it. About a year later I had it in the other foot. Only lasted the one day. About another year later my hands were sore. After the basal joint was removed I was sent to a rheumy and was diagnosed. And, yes my feet felt like I was walking on stones for a long time, (after I was diagnosed.) I’m treated with mtx and Rituxan. I just moved from PA to SC and thankfully, my PA Rheumy referred me to a colleague of his right here in Myrtle Beach. My first symptoms were iritis (imflammation) in eyes, then ankle problems (torn achilles tendons resulting in surgery on both sides). Not until extreme fatigue hit me last year coupled with finger swelling and pain did I get diagnosed with RA and start on treatment. While my symptoms did eventually spread to all fingers, wrists, elbows, and knees (my latest big battle), it all started with “non typical” RA symptoms that didn’t meet the traditional RA patterns. Thanks for pointing this out. I wonder how typical these “atypical” symptoms are? Is there any research out there about it? I keep looking Andrew. I am hoping to bring this to the attention of the “powers that be” . However, I have not yet read that anyone is on this bandwagon but me. Actually, I believe that this (learning how RA really begins) ought to be a concern of doctors, too, so that they could treat RA more “successfully” ; and researchers, because they could more “successfully” find treatments and a cure. My first symptom was my right shoulder doing what Kelly’s foot did. Middle of the night, most extreme pain I’ve ever been through, that did not go away like “normally”. 14 years later and my left shoulder never did get attacked…..I’m A-symetrical. Only this last year have my hands been involved. And, only my left hand. BTW, right shoulder has been classified as a “frozen joint”. My first RA flare was in my left shoulder. I thought maybe I’d slept on it wrong, somehow, though how sleeping on it could make it so painful I couldn’t raise my arm didn’t occur to me. I just didn’t have context for it. After that, shifted around. Big toe, right foot. Left hand, pointer finger knuckle. Feet that hurt all the time, as if I’d been standing on them all day. When I finally went to the doc over all this mysterious pain, I was stunned when he diagnosed RA. My first major flare up also involved my left shoulder and inability to move, rotate or raise my arm. I suspected RA due to family history and diagnosed myself before my doctor did, who told me “You don’t have that, you’re too young!” Shows how much he knew! Mine was my hands and my feet at the same time. But now both my shoulders are affected. I always forget, when looking back 2 years at how this all started, that my first attack was also in my shoulder. Years ago. Only one shoulder. Had no idea what was wrong, and neither did the emergency dept. where I ultimately went. I couldn’t lift it, move it, do anything, and it was so painful I was nauseated and sick. I wasn’t diagnosed with anything at the time, years after having nothing, it “came back”, I’ve got full blown RA. Mine was my shoulder also!! I also brushed it off like I had slept funny or something like that. I thought I was going crazy and people thought I was a hypochondriac. The pain would ease some as the day went on and the more I moved it and be gone in a couple days. Not to my understanding..it could be gout or 20 other things. The problem with RA is that the litmus test is very generic among most rheumys and internal med drs. Unless you are at a caliber of dr that really understands, many people go undiagnosed or misdiagnosed. I was one of many that suffered from swollen hands, ankles, and feet, but I was told that women over-react and come back in 6 months if I still felt bad. Not always true. It goes everywhere. Mine started in my back. Fast forward 10 years, it spread to my elbow and an MRI and subsequent synovectomy confirmed the presence of RA. started in 1 toe, then a few months later my fingers. My first sign 29 years ago was my left shoulder… couldn’t lift it without feeling like it would break.. then the next day the other shoulder kicked in, followed by my ankles and feet. My hands were ok then… but not now. I have read so many stories about the shoulder being first. Why is that in no books or studies? There is some significance here. This is not just a hand disease, I’m sorry. BTW, I know exactly what you are describing. My own shoulders did the same thing – about a month after my feet. BOTH shoulders in the same night!! It was like I’d been shot. I wanted to go to the emergency room. It was like labor pain. Good point. At least with childbirth, it is expected that you need pain relief. And with childbirth, there is an end in sight! My first symptoms was in the hand, in my right middle knuckle. Shortly after that, I had terrible trouble in first the left shoulder, later the right. I was in agonizing pain, went to a physiatrist (doctor specializing in rehab medicine) and couldn’t even tolerate gentle traction of the neck. Fentanyl patches made me so sick. Finally, my doc prescribed warm water pool therapy. After 6 weeks, I felt much better. 7 years later, the main things that help consistently, though temporarily, are warm water (93 degrees) pool therapy and an infrared sauna. Thanks for gathering this information–it’s so important! I was diagnosed 3 weeks ago on my 2nd appointment with the rheumy. I’m a little confused about what came first. In the past 2 years I’ve had 2 knee and 2 shoulder surgeries for tears. Each time I would wait to be fully recovered, but it didn’t happen. That’s a long story, so I’ll give you my best guess in the order they appeared. Left SHOULDER, left knee, right thumb, left middle finger, 3rd toe right foot. 3 weeks ago… both wrists, ankles and hips. Well I’m finally having symmetric involvement after 2+ years. This is why I didn’t get diagnosed early. Now I have 4 destroyed joints! YOU ARE RIGHT, THINGS NEED TO BE CHANGED!! More shoulders and ankles and hips before hands! I knew I was not alone! Ronda: I am so sorry this is happening. I have been right there. I call it the domino time – when the joints fall one after the other. My first year was like that – untill it was everywhere. People stopped asking – or listening – when it just kept going. Who could believe THIS much RA? heel & back pain, & leg cramps were my first symptoms. Recently I have had bad swelling in hands wrists & feet. Becky, I know what you mean about bruised feeling feet, I’m dealing with that right now! It doesn’t start with just swollen hands and feet. It can be in any joint. I have a friend just dx’d because she had pain & swelling in one knuckle. I know ppl whose knee(s) were causing them problems. If you have a joint then RA can get to it and attack it. Lately my jaw is killing me and is incredibly stiff in the morning. I had “TMJ” in high school that was probably RA (erosions now at 31), then foot pain that was “RSD” in college and kept me from running, then my wrists kicked in around 29, and that’s when RA was finally diagnosed. Liz, I agree with what you said. But, I have had more than one doc tell me the exact opposite to my face. Katie, it’s funny that when it got to the wrist, they could “see” that it’s RA. I am curious, was your doctor willing to say that it was RA all along? Felt like a tendon tear between the index and second finger in right hand. Then the hand swelled up. Then the second finger drifted. Hand docs gave me cortisone shot, thinking it was a torn ligament. Went to RA doc, who tested me twice; no blood test indicators. Diagnosed with sero-negative RA. Was on methotrexate and pred for 8 months to no changes, so he was ready to give me retuxin infusion. Second opinion said not RA and took me off drugs. Then what is it? It started when I was in elementary school with a knee that would swell every time I got strep throat. It was very strange but I missed a lot of school and certainly a lot of gym class. I spent so much time having tests done at Children’s Memorial Hospital downtown Chicago. Eventually diagnosed with Reactive Arthritis, when I was 15 I fractured my spine in a horseback riding/steeple chase accident, then when I was 19 I became really ill with a 104 fever and the drs said my gull bladder didn’t work (did not contract) which was making me ill. After I had that removed they were perplexed that a 19 year old would have gull bladder problems. Next I had iritis at the age of 20 (this was six months after my gull bladder was removed) and the Illinois Eye Institute said Iritis was serous and indicative of something else going on. I had blood work done, spoke with my primary dr who did more blood work and x-rays and diagnosed me with Ankylosing Spondylitis. After that dr retired I changed drs who said well you are young and a woman no way it could be AS but after all sorts of tests came back and said “I’ll be… you have AS!” I now have problems with my knees, hips, eyes, spine, c-spine, left shoulder occasionally ankles and fingers. My toes are ok so far. Today I realized that I am in so much pain and so limited that I don’t think I can work and I don’t know what to do. I am so scared and don’t know how to pay my bills and I’m in collections for two hospital bills that are hundreds of dollars after my insurance covered their part. Life is a very scary place with AS or RA and it makes me afraid that I will never be able to have children because I couldn’t care for them though I have always wanted to be a mom. Feet for me as well, I had a very swollen, red, hot big toe and happened to mention it to the doc when I went to see him about something else, I was (luckily!) diagnosed with RA from this visit as my bloods showed raised levels of ESR. After this it spread to the balls of my feet and then just seemed to be in a different joint every week, not really affecting my hands to badly until a few years later. Mine started with my knees. I thoght because I had played sports while growing up that I was getting old (a little early at age 32). A few years later I had a buging disk in my neck. I had no particular injury that I recall that caused this. It progressively got worse until surhgery to fuse was done. Next came a rotator cuff tear with apinched nerve in my right shoulder that required surgery to repair. I joked that my goal was to be completely re-built by the time I was 40! No one ever connected the dots. About 3 years ago I requested that my PC run an arthritic profile on me while doing some other routine tests because my Mom had Lupus. He did so, while the ANA was normal, I had an above normal RA factor. PC sent me to a rheumatologist who said that while he agreed that RA factor was high, it wasn’t RA because my sed rate and c-reactin were normal. Come back later. Not until this year, I saw an add on a website where UAB was looking for participants who had not received any treatment before with RA for a clinical trial. I had missed the study enrollment period but the nurse I spoke with was so sure I had RA that she made an appointment with the head of the clinic. However, not until the ultrasounds were done on my hands and wrists and revealed the inflamation and joint damage was I finally diagnosed with RA. Have been receiving treatment for 3 months now of Enbrel and methotrexate combo. I have not seen any improvement yet — but I am still hopeful ! Feet and shoulders. I was already in the process of being diagnosed when it moved to my hands. For me it all started with general aches and pains and extreme exhaustion.At first I chalked it up to the normal aging process-but when I looked at the energy my older sibilings had and asked if them if they had aches and pain similiar to mine and they said no. I went to the doctor and basically told her I felt as though I was 90 years old. She ran the basic labs for RA and sure enough that was it. I first had RA symptoms in several joints all at once (hands, wrists, feet, knees, shoulders, hips, elbows). I also had lower back pain, but my rheumatologist said that my back pain couldn’t possible be related to arthritis. (I have doubts if that’s really true.) Eventually, the pain subsided in most joints except for my hands and feet. After 3 years, the pain and swelling in my knees has started to come back, though. My early symptoms were my feet and hands together. My feet hurt so bad I would dread getting up and having to walk on them while my hands were so stiff and swollen, I could not close my hand to make a fist. Mine started initially with occasional wrist pain. Fast forward 10yrs, then it really kicked off beginning with my knees & rapidly spreading to almost every joint in my body. Have had RA almost 3 years now & in that time only had swelling once in my left elbow & once in both hands. The pain & stiffness has been horrendous at times but through all that i had none of the swelling that the doctors look out for. My RA started primarily in my left ankle. I could not walk on it and it was swollen to a point where it did not even look like an ankle any more. My primary care physician gave me oral steriods and told me to call in 6 weeks. The swelling got worse. I instisted on seeing a specialist. He was a little slow to find it, but did. I had xrays, ultrasound, and finally an MRI. nothing. Then lots of bloodwork. My RA factor was 63, it should be less than 14. He sent me back to my primary and then my primary sent me to a rheumtologist. Now i feel it in my knees, hips, and shoulders. I hope it stops soon. thank you. I recieved another burst in my behind this time and talk of adding a third oral medication. It is better, but not doctor said its not good enough. I am just concerned about the effects that predisone has on the heart, especially since heart disease is already in my family – mostly the men though. I started with deformed toes. The podiatrist asked if I had RA but I didn’t know it at the time. About a year later I woke up with extreme pain in my left shoulder. I thought I was having a heart attack and went to the ER. They sent me home with vicodin. The next day I had the same pain in my right shoulder. It took about 3 months before I got diagnosed with RA. That was five years ago. Kelly, how do we un-diagnosed people know to go to a doctor? Like you, I don’t like to head to a doc for every ache and pain. How do we know what is a warning sign and what is just…well, not a warning sign? Keen question, Christy! Here’s my brief answer, but you have got me thinking!! Any GP can run 2 easy blood tests (anti-CCP and Rf) which will catch almost 3/4 of RA. If those tests are negative, and symptoms persist, most people do keep going to the doctor. Unfortunately, GP’s are not really good at recognizing early RA. We need to train them to do that. Part of my reasoning behind the Onset Story project. As you’ve read here, the first symptom might be extra-articular (not in a joint). That is trickier and it is even more important to have a smart doctor. And that leads me to my final point… you are showing how much an awareness campaign about RA is needed. The PR problem is exacerbated frequently by things like the Woman’s Day article and the People magazine citing. My did start in my hands. I started dropping things a lot. Broke every piece of stem ware in the house. Knuckles swelled and became so stiff I couldn’t pull the lid off the yogourt container nor open a zip lock bag. I eventually developed little “red” papules on my distal finger joints (just below fingernails. Those I now know are Herberdeen’s nodules. Couldn’t grip the steering wheel of the car. It next spread to wrists, then feet/ankles, then knees. By month 9 it had spread to shoulders and elbows, entire spine. Now after one full year of RA, it is much faster to tell you where I don’t have it: my hips. Mine started in my feet also.They hurt soooo bad! !Went on to my knees and felt like I was walking bone on bone!! But what really helped get me diagnosed was the stiff neck I had for over a month!I called my Dr and told him I wasnted him to run every blood test there was out there until he found out what was wrong with me!! I was working as a housekeeper at a local hospital for 27 yrs! Just thought when I hurt it was from alot of heavey lifting and hard work! I can no longer work and am on disablity.But with meds I am able to function very well right now. Its not been easy to get the right meds all lined up! Been threw several. Metho helped the best but damaged my liver so had to stop it. Now on Humara..and several others. So far so good. PRAISE GOD…with out GOD in my life Im sure I wouldnt have made it this far. I have been so BLESSED yet again by finding your site. RA people are so devoted to one another…its like a brotherhood thing.Some times I beleive GOD brings people together threw illnesses to join fourses and help others!! GOD BLESS u all my brothers and sisters in this RA world together..U R all awesome…. And God bless every one of us. My hands were the first body part diagnosed and the feet followed a month or so after. However, I had TMJ in high school (10 yrs before the RA diagnosis) and I had bursitis in my shoulder about 5 or 6 mos. before the RA diagnosis. The TMJ & busitis could have actually been the first RA symptoms. Just fyi. In rare cases, pulmonary fibrosis might be the first “sypmtom” of RA. It could go on for some time, “asymptomatically” before being diagnosed either incidentally or because one finally gets so short of breath they seek answers. Even then it could be a while before the typical signs of RA, or other autoimmune disease make themselves apparent. This can make it diffucult to distinguish pulmonary fibrosis associated with collagan vascular diseases from idiopathic IPF which generally doesn’t respond to the RA drugs and prednisone. I had slight knee and elbow problems a couple of years before mine hit bad enough to go to a doc. If I recall correctly, I may have had some eye inflammtion a few times during that period. The summer before the winter I was diagnosed, I had some minor feet symptoms, with general stiffness and gelling after physical activity and starting to feel like a 90 year old at 30. Was a weekend yardwork warrior and figured I was just getting out of shape or something. The fall season a year before, I got a bad case of shoulder bursitis. All of these were written off to other, and as being minor things obviously. It was the pain in my wrists when I tried to lean on them while sitting on the floor that took me to the doc finally, and then the constitutional symptoms seemed to hit hard then. The puzzle pieces make sense after the fact, don’t they? Hoping education will make a difference on this someday. Hope you are getting some relief. I cant believe I’ve found this site! there is so much information here I dont know where to start. I THINK my arthritis started with pulmonary sarcoidosis- an autoimmune disease in my lungs. I was first treated with prednisone, and it worked except for massive side effects, and I then got osteoporosis and needed cataract surgery in both eyes, just for starters. Then they put me on methotrexate, and it worked like a miracle. When they thought the flare up of sarcoid had ended, they began to slowly wean me off the methotrexate- it took at least 6 months. When I was down to a low dose I began to hurt all over- knees wrists shouders ankles fingers, and swell up. I couldnt even stand up or ride in a car for any length of time, and yet after reading some of this I think my pain was less than alot of yours. They put me back on the methotrexate, (but I flat out refused the oxycontin offered while the methotrexate got going, as my mother had been a morphine addict thanks to her Dr’s help for pain aleviation, and that scared me to death!) I lived on over the counter pain relievers, which hardly worked at all. Eventually the methotrexate worked and for many years I had no trouble at all. My rheumatologist is a great Dr at Yale New Haven hospital in Ct. I see him regularly. Then last year I began to have lung trouble again- out of breath, fatigue- and went back to my pulmonologist also at Yale. They took me off methotrexate, and started substituting with azathioprine, and prednisone again, watching carefully to see if the arthritis would flare up again, and it hasnt so far. but I’m not sure if the azathiaprine is working either. I’m told that my lung problems are all part of rheumatoid arthritis, which is something I dont really understand, beyond the fact that my lung tissue is inflamed and that seems to be the thing that is doing the damage. The lung part is diagnosed as interstitial lung disease, with no known cause.I’m hoping that somewhere in here I can find some info that none of my previous searches have come up with. thanks so much! I’m glad you found it Jennifer. Welcome. 🙂 Yes, RA can cause several types of lung disease (or heart or eye disease). 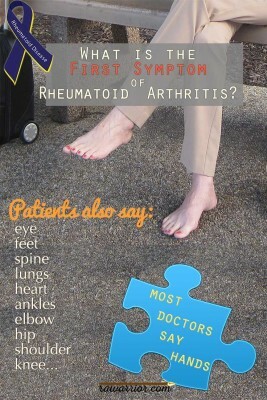 I’ve met several RA patients who had one of them as a first symptom. I do not have a post specifically about all of the lung issues yet – there is always a long list of more RA topics I want to cover! Good luck to you. I am really curious now because I had pneumonia in 2006 and again this year in December and then in May. They never were able to determine what type of pneumonia I had and said it was A Typical. I am being tested now for RA and Lupus. I have never had any problems with my feet, shoulders, knees, ankles, hands, wrists etc. hurting and swelling do bad that I actually wanted to go to the hospital for some type of relief. I am wondering if my issues with contracting pneumonia would have any bearing on me having RA. Will have to wait until all tests results come back. I too had Pnemonia several years in a row!! Then all over fatigue, leg vein clots, hand pain, shoulder pain, inflammation of heart lining, then shoulder pain, hips, feet, ankles, toes, neck, back and headaches with the fatique. But, I knew something was so so wrong with the lung problems over and over. I thought I was the only one!!! We need to keep in touch. I too have had pneumonia three times. The third time was October 2012 and my hands swelled up so bad my wedding ring had to be cut off. Then 3 months later I got influenza from a patient I was caring for (I’m an RN). They did blood tests (for the third time over the course of many years) to check for RA but they were negative. Then within 3 months of having that flu, my right wrist was painful and started swelling (April 2013. After steroids which helped a lot, it was worse by August. I was referred to a hand specialist who scheduled a synovectomy which I had done in Jan 2014. He checked my CRP which was negative and said I showed no evidence of RA. I had already scheduled an appt with a rheumatologist, so in early March went to him. He ordered the anti CCP which was 137. So, finally diagnosed this year. I still believe that some symptoms throughout my life have been due to RA…carpal tunnel symptoms for at least 20 years, knee pain, heel pain, back pain and disc problems. I always thought my aches and pains were due to my activity level…not anymore! Chelsea, and all that have posted on the rawarrior site…. 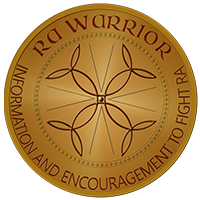 I am newly dx, April 2014 and forgot how I come across the site but so glad I did, and addicted to all the rawarrior site brings and addicted to ALL THE INFO that I can read and relate to…. Lung, shortness of breath, heart, racing heart rate feelings, luckily no pneumonia yet. Maybe as a young child!!!! Lots of tests and they say they are normal. Who knows how long it’s in your system playing havoc…. Since the Docs can’t figure it out and give us the info we need, we just have to do it ourselves!!!! I always said “if u want to get it done, do it yourself”!!!!!!!! No support groups, no classes for info!!!!! Whats a person to do… Read rawarrior!!!! It was my feet – my heels hurt. Very first symptom. My fingers were the last to hurt before my rheumy started me on prednisone. Luckily, I haven’t experienced any deformities in my joints. Doctor found a little erosion in the bones of my feet, but that’s all. Jackie, it was a long time before I knew that my 30+ years of heel pain was part of the RA I’d had in my feet all that time. I thought that heel pain “couldn’t” be RA until my 1st rheumy explained it to me at one point. Feet, feet, feet… See here at the ending to my Onset Story. I wanted to post this for the people who here who have talked about thier arthritis movin from joint to joint. Mine started with sewlling and pain in the bridge of my nose. It went away and came back again about a year later. A year or so after that I had extreme pain swelling and redness on the top of my right hand. After that went away I too woke up in middle of the night with my shoulder. My Rheumatologist diagnosis me with Palendromic (traveling) arthritis. Palendromic Arthritis is the most painfull form of arthritis. It’s onset is very sudden(within a half hour) but only last about 24-48 hours. I have found that the severe pain from it last about 6 hours and then slowly strats to get better. My Rheumaiond factor was very high and I had a positive CCP. She told me that 60% of people with palendromic arthritis go on to develope RA, especaily people who had positive lab test. My fist symptoms apeared in about 2004. Last October she gave me the diagnosis of RA. It now involves my left hand, right shoulder, right ankle, and left big toe. I have nodules on toes in both feet and in both lungs. That’s very interesting what your doctor told you. There are some articles on Palindromic Rheumatism / RA on this site. Here is a link here and here. Also my Onset Story here. My RA was palindromic for over 25 years. It would come and go. Then 4 years ago, it stopped “flaring” and just stayed. It’s in every joint & has affected other things like you. Your story is another one that shows that Palindromic RA is not something “harmless” – I wonder how long ago it began to affect your lungs or cause damage. Thanks for sharing here. Maybe you’d like to submit your Onset Story here. I am in week 2 of my RA diagnosis and asking this out of sheer ignorance: Did anyone here lose weight with RA? I had lost 11 lbs., when I was diagnosed compared to my visit with my doctor in July 2009. Since I had been sick for about 3 weeks, I would assume most of that weight loss was recent? The onset, initially, felt like a bout of flu from hell. Then, the additional symptoms appeared & I knew it wasn’t flu. Now, I’m on Methotrexate as well as other medications and nausea has become an almost daily thing. How common is weight loss with RA? Does it level off after a few pounds, or is it another factor for me to monitor? PS: I’ve been working hard on a “map” for the newly diagnosed. It’s almost finished so I hope you’ll check back in a couple of days. Yes, yes, and yes! I had the worst “flu” ever, too! I hurt all over so bad, I went to the doc in the box who said it must be the flu but never did a test. If I could have gotten out of bed I would have gone to the emergency room. After about 2 weeks, I started feeling better but than my one big toe started to hurt, followed by the other a few days later, and it just kept going. I have lost weight for the past two years since it started. Only recently I started enjoying Food again, so I’m hoping that is a good sign! My RA began with a horrible viral infection temps ran from 102 to 105 for a week. Ended up in the hospital getting pumped full of fluids and drugs. Within 2 weeks I started having problems with my joints — could’t raise my arms to shoulder level or get up out of a chair without help. Driving was scary — I couldn’t turn my neck to check for traffic so I had to turn my entire body. My elbows looked like really large, red grapefruit and the knees were about the same. I started doing some research on what it might be and went to see my internist. She checked me over, listened to what I had found and said I think you’re right it’s RA. I’ll run the intital blood test and make an appoinment with a rheumatolgist. Took another three weeks to the the Rheum who repeated the tests and got me back in before saying yes, it was RA. He started me on the lowest levels of MTX and plaqueinile. Not much help, so he added lots of steroids. Thankfully he went off to teach so I found a new doc who weaned me off the prendisone and got the other two drugs up where they should be. Then we moved to Dallas — Rheumy doctor number 3 took one look at my chart and asked why they didn’t have me on remicaide. It’s been a big help and I get around pretty well most days. The past year, though has been one major infection after another. Spent an entire week in the hsopital with pneumonia (2nd round). They had me in insolation so got to see lots of masked faces and have the joy of being gowned, masked and wheeled through the hospital to radiology. People really hug the halls when they see that site coming. Anyone else had problem with massive recurring infections? Recurring infections? Some patients have that while others go years on these medicines without it. Sounds very annoying. My first symptom was pain in my feet . It was only noticeable during the night when I would waken and walk to the toilet. I would sort of limp around. Also first thing in the morning my feet, the sole of one foot to be exact and also the tendons would feel stiff and sore first thing until I had warmed up by moving around a bit. I had no idea that was the beginning of something nasty. I have only recently had the blood test and it has come back positive, so I’m going back to my doctor tomorrow. I have had a swollen index finger or a month now and pains in various other joints. It seems to move around alot…is that normal?? One day my right foot will hurt and the next day it’s fine and my hip will be sore. For a couple of days I had chest pain so bad I couldn’t take a deep breath without pain. Is it normal for this to be so changeable?? I have a question… has anybody here chosen to forgo medical treatment and pursue alternative treatments for RA? ANd if so what were they and how did it go? I am unsure of whether to do the drug thing because I haven’t heard any stories of anyone getting better on drugs. Or am i missing something?? Hi Lisa, RA does not have a cure. 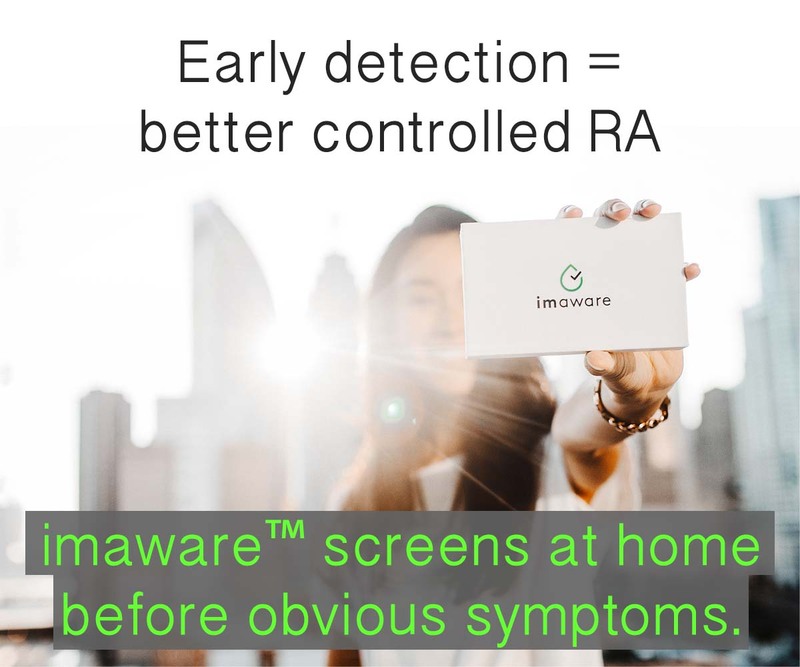 There are treatments that help most patients to do much better with symptoms – with the goal of reducing or delaying the permanent damage RA causes untreated. Here are some links that might address your question: click here and here and here. I hope that helps. Good luck. Last year I experienced severe hip pain. After several Dr. visits, and x-rays I was told there was nothing. The pain continued. This year I have joint pain in both hands, wrists, feet and ankles. I still find it painful to rest on my hip at night. It’s been an ongoing struggle to stand straight up and walk from a sitting position. Now my right knee has joined in on all this. Last year I had good insurance. This year I’m unemployed. My GP has given me a RF blood test and indomethacin until a dx is confirmed. From what i have read thus far a dx is hard to come by. Wish me luck with this. I haven’t felt like myself in some time. I should not feel like an old woman at 55. This fatigue is wearing me down a little. Thanks for being here to read this. 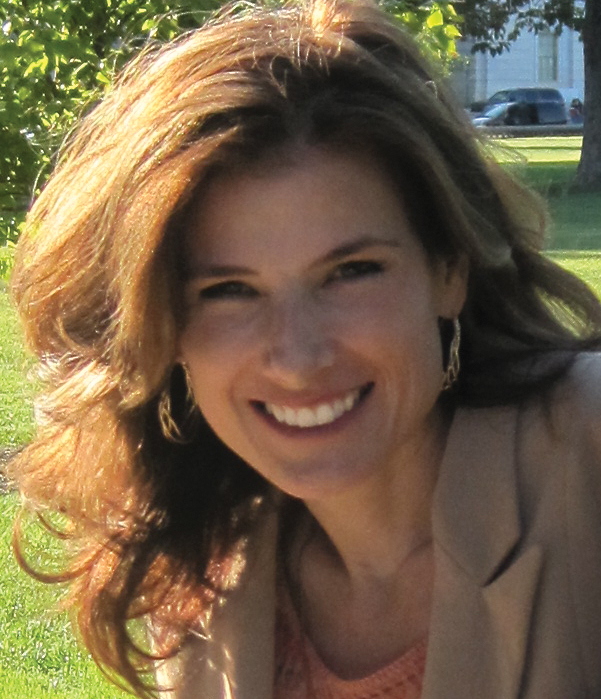 Debra, Diagnosis is not hard to come by exactly – but it does take someone who is willing to listen & believe you. Good luck to you. Oh, did you read the Do I Have RA? page on the top menu – there might be a little help there for you w/this. Hi Sera, I hope you don’t have RA. You do need to get to the bottom of it soon so you can get the right treatment if you need it. As far as RA goes, did you read through the “Do I have RA?” article on the main menu at the top of this page? If it is RA, x-rays and blood tests might help, but not always. Good luck to you.